"Gnome Restaurant" is an Activity where you have to make and deliver gnome foods and drinks to gnomes all over runescape within a certain amount of time. After succesfully delivering the right food or drink to the right gnome, you'll get 1 or 3 credits, depending on the assignment. When you have 12 credits, you'll get 1 token. This token can be activated and when you activate it, a gnome will come to you on a terrorchick and give you some food. Aside from the credits and cooking xp, you also get tips from the gnomes. Start by talking to Gianne Jnr. on the second floor of the Grand Tree. You can find him in the North-Western most corner. Before you can work for Gianne Jnr. you'll have to get recommendations from Gianne Snr. and Blurberry. Gianne Snr. can be found just east of Gianne Jnr. in the gnome restaurant. Blurberry can be found at the other side of the tree, at the gnome bar. Gianne Snr. wants you to cook some food to get his recommendation. He'll give you a cookbook with all the recipes and the ingredients for the food he wants you to make. After you made everything, he'll give you vouchers for 100 Gianne Doughs. To make something you always have to put Gianne dough into a Batta tin, Crunchy Tray or Gnomebowl mould and heat it on a range. Now you'll have half baked batta/crunchy/bowl. Click on the half baked batta/crunchy/bowl and click on the thing you want to make. Now you have to cook it and you might have to finish it by adding a last ingredient after you baked it. If you make a mistake or need more ingredients for future items, trade Hudo to buy all the ingredients you'll need (apart from Frog Legs and King Worms). Frog legs and King worms can be obtained by picking them up at the swamp, west of the Grand Tree. When you pick up a toad, you only have to pull of its legs. Blurberry wants you to make some cocktails for him before you get his recommendation. Just like Gianne Snr. he'll give you a cocktail guide with all the cocktail recipes and the ingredients you need for the cocktails. To make a cocktail you first need to buy the right ingredients (check your cocktail guide) from Heckel Funch (East of Blurberry) and put them in a cocktail shaker, now you need an empty cocktail glass and you might have to slice and dice some fruit to finish the cocktail, some even need to be warmed before you can serve them. You now have the recommendations and skills to become a real delivery boy or girl. Talk to Gianne Jnr. and click on "I think I'll warm up with an easy one" to get an easy task or "The edge of the world is no limit for Alift Aluft Food Deliveries!" for a hard(er) task. Gianne Jnr. will give you a delivery basket, this basket tells you who to deliver to, what the gnome wants, how much time you have left and where you can find him. If you happen to lose this basket, Gianne Jnr. will give you a new one. You can also bank the basket, if you need more inventory space but this won't stop the time, if your delivery basket is still in your bank and you haven't delivered your order, it'll stay in your bank but it has no use, if you click on it, it'll say that you aren't playing the game and it'll dissapear. For more recipes, check your cookbook and cocktail guide or the Gnome Food guide. This is where your cooking level comes into play. At Cooking level 42 you can make all items needed in this game. Should you have a lower level you run the risk of having to turn down a task, because you cannot make the item needed. When you turn down a task, you'll have to wait 5 minutes or you can do a different kind of task, so if you turned down an easy task, you can still do a hard task and vice versa. When you fail to make a delivery in time, your delivery box will dissapear and you'll have to go back to Gianne Jnr. for a new task, you won't lose any points. When you've reached 120 points you'll still be able to do jobs and you still gain credits and you still get tips, but you won't get any more than 10 items. Brimstail: He lives in the cave in the south-western most part of the gnome stronghold, east of the Terrorbird pen. Burkor: He's on the platform south-east of the gnomeball field. Captain Errdo: He's operating the gnome glider on the top of the Grand Tree. Coach: Around the Gnomeball field, west of the Grand Tree. Dalila: She's the old lady sitting at a table in the gnome restaurant, near Gianne Snr. Damwin: She's a cheerleader on the most eastern platform, east of the gnomeball field. Eebel: He's on the platform east of the Terrorbird pen and Brimstail's dungeon. Ermin: He's at the northern most spinning wheel, south of the agility course. Femi: Outside the gates of the stronghold. Froono: He's on the platform south of the bank in the centre of the stronghold. Guard Vemmeldo: At the bank in the centre of the stronghold. Gulluck: He runs the weapon shop of the Grand Tree on the second floor. Heckel Funch: He's east of Blurberry. King Narnode Shareen: On the ground floor of the Grand Tree. Meegle: At the Terrorbird pen in the south-western most corner of the stronghold. Perrdur: He's the old man at the gnome restaurant near Gianne Snr. Rometti: He owns the clothing store on the first floor of the Grand Tree, the eastern part. Sarble: In the swamp north of the stronghold, west of the Grand Tree. Trainer Nacklepen: At the Tortoises, north of swamp. Wurble: On the platform south of the gnomeball field. Ambassador Ferrnook: The second floor of Varrock Castle, in the northern room. Ambassador Gimblewap: Upstairs in Ardounge Castle. Ambassador Spanfipple: The second floor of Falador Castle, near the jail cells to the south. Captain Bleemadge: He's operating the gnome glider on white wolf mountain. Captain Daerkin: He can be found watching the fights at the dueling arena. He's on the southern most platform. Captain Dalbur: He's operating the gnome glider in Al Kharid. Captain Klemfoodle: He's operating the gnome glider on karamja. Commander Montai: Near the entrance to the Tree Gnome Village, near the Tortoises. Gnormadium Avlafrim: He's operating the glider in Feldip Hills. Hazelmere: On the island west of Yanille. King Bolren: Next to the Spirit Tree of the Tree Gnome Village. Lieutenant Shepbur: Near the entrance to the Tree Gnome Village, he's in command of the Tortoises. Penwie: He can be found on karamja, west of the glider. He's walking at the snakes, he might be hard to find because everything is green. Professor Onglewip: He can be found on the ground floor or outside of the Wizard tower, south of draynor village. Wingstone: He can be found anywhere around the crevice, west of Nardah in the Kharidian Desert and south of Nardah. Either use the magic carpet to Uzer and run south or use a fairy ring and continue to run south to get there fast. 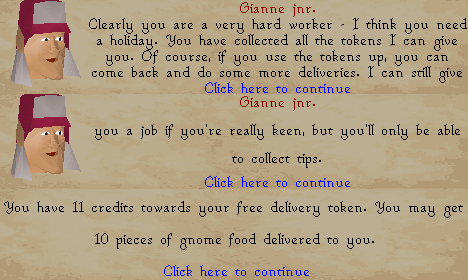 Easy tasks will get you 1 credit every time you succesfully deliver the food or drinks and the gnome will give you coins as a tip. 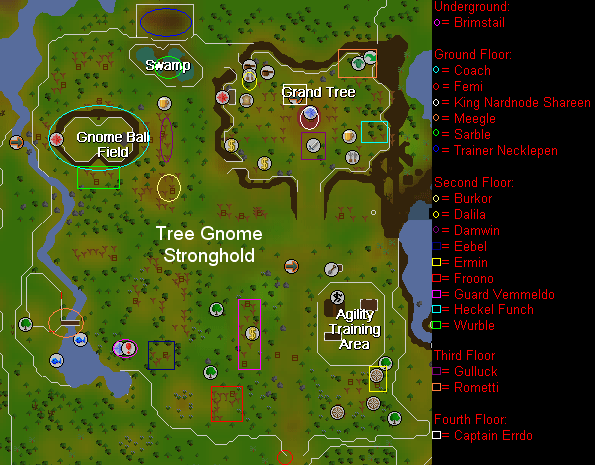 All the gnome are located around the stronghold and you have about 6-7 minutes for most tasks. Hard tasks will get you 3 credits every time you succesfully deliver the food or drinks and gnomes will give you great rewards like half keys, bird nests with seeds, uncut gems and bolts, 3 noted toadflax, a snapdragon, goutweed, gnomeballs, but there are also 4 special rewards you randomly get. You can get Gnome goggles, Gnome scarfs, Gnome mint cakes and Grand seed pods. Gnome goggles: The goggles of a real gnome pilot, now you can look like a pilot too. Gnome scarf: The scarf of a gnome, this'll keep you warm. Mint cake: This gnome cake will restore 50% of your energy when you eat it. 1. Launch - You can only use this outdoors, a gnome pilot will see you and pick you up, this will take a while. 2. Squash - When you squash it, the roots of the Grand Tree will appear and you'll be taken back to the Grand Tree instantly. Both ways won't work past level 30 wilderness. The pods are stackable and tradeable. You get a reward token when you have 12 credits from succesfull deliveries. This token can be activated and when you do, a gnome will come to you on a terrorchick and bring you food. You get 1 item for every 12 credits, the maximum is 10 items. After you activated it, it'll be destroyed. You can only have 1 token at a time. To save time, buy lots of ingredients and store them on your bank, so you don't have to run to the shops or teleport back if you forgot to add something, you can also make everything a couple of times and store them on your bank, so you only have to take it out and deliver it. You can search the kitchen cabinet at Hudo to take a Batta tin, Crunchy tray and Gnome bowl from it. As soon as you get the delivery basket start to deliver, don't waste time finishing the conversation with Gianne Jnr. If you log out, time won't stop, so deliver your item before you log out if you don't want to fail.